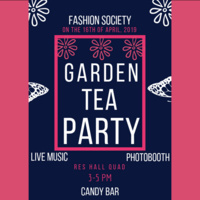 Come enjoy a candy bar and music with Fashion Society! Wear your Wacky Tacky Tea attire out to the ResLife Quad and get a photo opt with tea party table. The event is April 16th from 3-5! We'll see you all there!